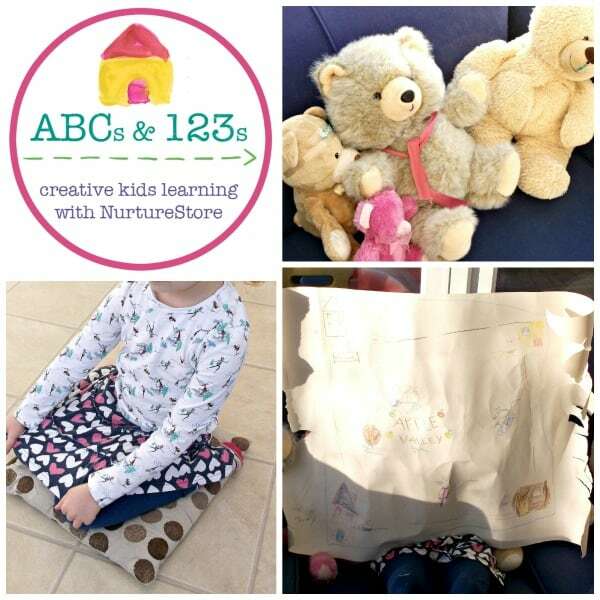 Welcome to a brand new ABCs and 123s series here on NurtureStore. I’ve invited some of my favourite play and education bloggers over to share a fantastic collection of ideas that you can use with your children to introduce letters, language and math through multi-sensory, play-based activities. Follow along with the ABCs and 123s series and you’ll have a super useful set of ideas that you can use with your child that will help them build skills while having fun. 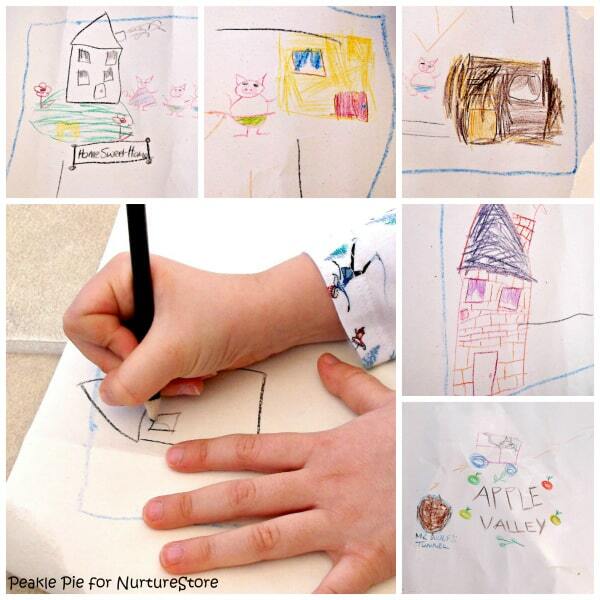 For our first idea, please welcome Helen from Peakle Pie who is sharing a story map idea. Story Maps are a great way to help tell a story in a fun way that kids will enjoy. The idea is to use a map to retell a story and to collect the items along the way, similar to a treasure map. It is an ideal way to introduce stories, to retell a story that your child knows, or to add an extra ‘twist’ to the story by adding an unusual prop or character. First think where you are going to make your story map, it could be in the garden, a dining room or hallway. Next, decide if you are going to tell a story that you already know or if you are just going to make one up. Place props and toys around the ‘story map’ area and mark on your map where different characters, props map and scenes are in the story. 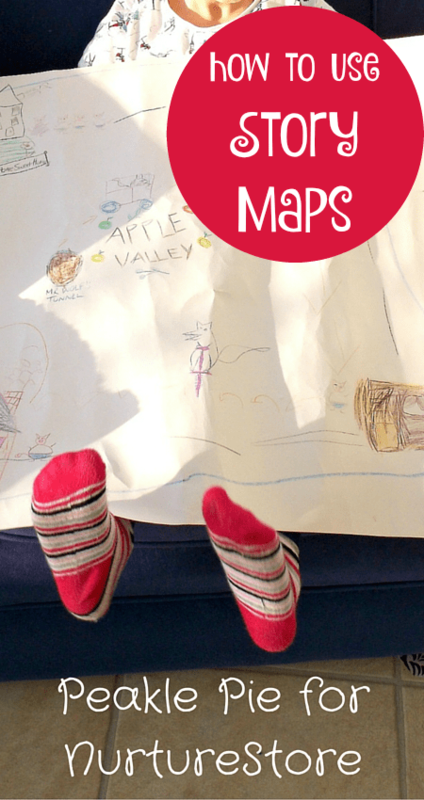 Give your child the map and go on a story adventure! Retell your story and use dramatic voices and gestures to encourage your child to take part. We love retelling fairytales in this way and we really enjoy acting out the story as we go. Encourage your child to use different words to describe what they are seeing and doing as you explore your story map. This is a great way to encourage imaginative play and to expand their vocabulary as well. We love to add something a little different into our story and often a toy dragon or car may be used in the story. Finally, we end the story by discovering some ‘treasure’ which is related to the story. It could be the book, or some stickers to make a picture with, or a DVD to watch together. My daughter Peakles is now at an age where she can make her own story maps and use her toys as part of the story too. 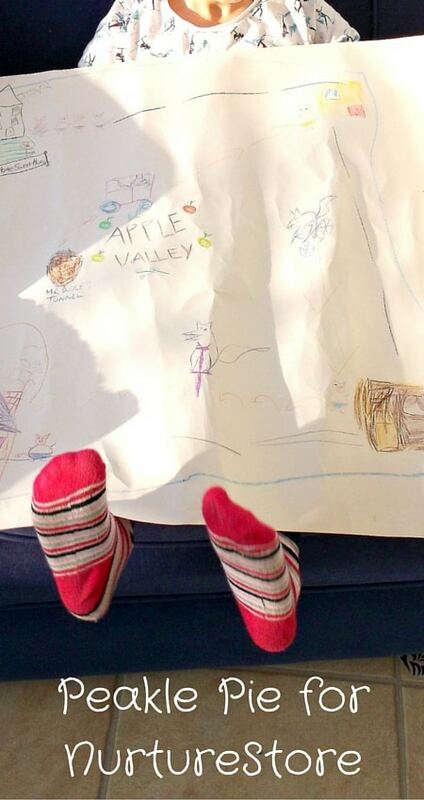 She will draw her own maps, place items around her room or outside and take me on the story map adventure. There is nothing like the three little pigs riding around in racing cars to add a different slant on a popular story! Peakles has also started to write words on her map and is beginning to explore stories that she has made up as well as variations on stories she already knows. Her vocabulary and understanding of a story are good. She loves adding lots of description to her stories and she is very confident in acting it out and she refers to her story map when necessary as well. All in all, we love creating and using story maps and think you will too. Why not give it a go today and let Cathy from NurtureStore know how it went in the comments below? Here at Peakle Pie, we have also enjoyed playing and learning to be Musicians, have hosted a Queen’s Tea Party and explored mathematics with our 5 Funny Ways to Measure our Feet! I’m Helen, and Peakles is my five-year-old daughter and we love playing, creating and exploring. I try to maintain that ‘hands on’ feel with our site and Peakles is involved with every craft and activity featured. I’m also an art historian, teacher, and a very busy business woman! We would love you to visit our site Peakle Pie and share more great ideas with you! All our favourite literacy activities, all in one place :: download our ABCs and 123s guide here.